Question: Please tell us what five dry flies you are never without. That means, if we looked in your fly boxes, what five dries would we be guaranteed to see? Answer: I carry a lot of flies I fish only occasionally, and a relative few I fish regularly. Makes me a pretty typical fly fisher. The problem, Jack, is that two of the five floating flies I fish most are not commercially tied; that is, you won’t find them for sale in fly shops and catalogs. Not a problem if you’re a fly tier, but a nearly insurmountable one if you aren’t. So for the two flies you can’t purchase I’ll provide dressings for tiers, and substitute patterns for those who buy their flies. Because your question is about dry flies, I assume it’s about dry flies for trout, since dries are rarely used for other fishes. There are trout lakes and trout streams, and since you didn’t specify which the five dries are for, I’ll go with streams, since that’s where probably 90% of trout fishing goes on. And I’ll include floating flies that imitate insects struggling from their shucks at a stream’s surface, flies we call “emergers.” Emerger flies have exploded in number and popularity over the past few decades. For good reason: emerging insects are easy trout prey. Imitating them just makes good sense. Catches trout, too. This leaves us with my most-fished five dry flies and floating emergers for trout streams, plus the substitutes for non-tiers. A bunch of my original fly patterns are tied by the Solitude Fly Company, but currently, only one among my workhorse five floaters is in their line. Three of the five are my original patterns—shocker! Why would someone who designs flies, I wonder, actually prefer them? You don’t suppose they trust and believe in them, and that’s why they finally shoved them out into the world, do you? Caveat: if you had asked me this five years ago, Jack, or were to ask it five years from now, the list might have different patterns in it than the ones I’ll present today. Why? Evolution. My fly choices are always evolving (or at least changing, but I prefer to think evolving because it makes me sound sophisticated). 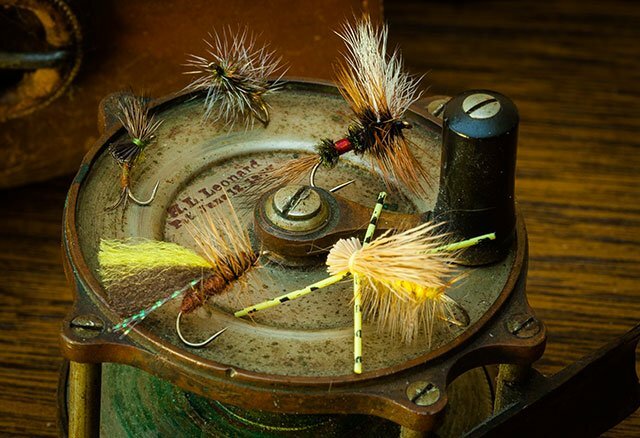 Okay, here we go: here are the floating flies I fish most of the time on trout streams. This imitation of an emerging mayfly is essentially half Bob Quigley’s Quigley Cripple and half Al Caucci and Bob Nastasi’s Compara-dun—so thanks, Al, Bob, and Bob. You could say my Morris Emerger’s unoriginal and you’d be half right, but since it’s a hybrid that’s really half and not fully either of its progenitors, you’d also be half wrong. It’s an original combination. I vary this fly in color and size all the time to match all sorts of mayflies. I sometimes vary the materials and construction for the abdomen as well, for the same reason. In case you don’t already know, Jack, mayflies come in a wild range of size, coloring, shape, and stoutness. Some mayfly nymphs have prominent gills along their abdomens, some don’t, and Morris Emergers are half nymph (and, of course, half dun), so gills may or may not be a factor in how the fly’s abdomen is constructed. Do trout care about mayfly emerger gills? Probably not, but maybe, sometimes…possibly. I usually fish a Morris Emerger dead drifted during a mayfly hatch, and normally among rising trout. But I use it sometimes when trout aren’t rising, just to show them something familiar. And I believe the way the abdomen of a Morris Emerger hangs below that reflective underside of water catches their attention (especially if you keep the abdomen free of floatant, though I do use floatant on the thorax and wing). If the mayflies I’m imitating are flipping about and testing their new wings or squirming from their shucks, I give my Morris Emerger intermittent twitches. The Morris Emerger is tied commercially by the Solitude Fly Company in several variations and a bunch of sizes. I presented the original Skip’s Promise to fly fishers through my little book The Salmonfly, Guide to the Dream Hatch of the West. Then I added a hackle. I still fish the original hackle-free version but mostly on quiet flows—its form is cleaner and a bit more convincing than the newer, bristly one, but it doesn’t float as well. The hackled version is a fairly stubborn floater. The hackled version also, despite its bristle, has proven itself on some cagey trout. As with my Morris Emerger, I tie the Hackled Skip’s Promise in various sizes and colors. That way it can imitate a bunch of stoneflies, caddisflies, and, if I trim the rear rubber-strand legs long and the front ones short, grasshoppers. I started out tying it only on hooks of size 10 and up for large trout on large water seeking large to enormous bugs. But last September, I fished a size 14 for 10- to 14-inch cutthroats in a Montana creek and it floated, fished, and caught fish just as well as I’d hoped. When I have the sense trout want something big and meaty even though no big bugs are on the water, I often fish a Promise. And often enough the trout come up for it. Sometimes I tie the fly as an unnatural attractor pattern, with a purple body or in a pale-winged, red-banded Royal-Wulff theme or such. I figured out long ago that trout can catch a yen for peculiar attractor flies. Although it’s got a convincing form and settles body-down the water as a stonefly or grasshopper does, I’m convinced that the element of this fly that rouses lethargic trout is its legs. Long and springy, they sway in river currents. They seem to stroke when you give the fly a twitch. I’ve come to rely on my Hackled Skip’s Promise more and more. It was a hit during a season heavy with grasshopper fishing a few years ago—the big clumsy bugs kept showing up on wilderness cutthroat streams and well-known, well-fished rainbow rivers and on spring creeks with large, cagey rainbows and browns—and the Promise just kept fooling them all. And then there were the smaller sizes I fished a dozen days on that Montana creek and on a local small stream three days this past season; the fly floated long, was easy to spot, and the trout seemed to think it was just right. Typically tied on tiny hooks, to imitate equally tiny midges, the Griffith’s Gnat is a convicted killer—scads of fly fishers have been fooling cagey trout with it for decades. It’s a simple dressing, and rough, even messy—but there’s nothing tidy about a midge wrestling free of its shuck at the top of a trout stream. I try to smear floatant only over the fly’s upper half, at least in the beginning, so it’ll settle partway into the water. Once it’s a bit waterlogged, I do what I have to to keep it afloat. Tough fly to see out there: dark, half sunken, perhaps in only size 24. I just set the hook when a trout rises near where I figure the fly is. But you can always trail it on some tippet behind a bigger fly and set the hook when the bigger fly twitches or goes under. The Griffith’s Gnat is tied commercially. I’ve been fishing the Skaddis (Skip+caddis, get it? ), an adult caddis (obviously, by now) and adult stonefly imitation for over 20 years. It floats well, offers trout a convincing outline, settles its body on the water as a real caddis settles its own, ties quickly, and fools the kind of trout that regularly frustrate fly fishers. I tie it in whatever size and colors imitate the natural the trout seek. Or I just tie it in sizes and colors that please me. During a caddis hatch or small stonefly activity, or just whenever a Skaddis seems right, I drift it up to rising trout or to a place where a trout might come up for the fly. If that doesn’t work, I twitch it—especially if the real caddis or stones are scurrying across or making some other fuss on the water. I know… such an obvious choice. Probably the most popular attractor dry fly of them all. But I really do enjoy fishing and catching trout on this venerable old pattern. It’s the offspring of an even more venerable and older dry fly: the Royal Coachman. Honestly, I think a substantial chunk of the Royal Wulff’s appeal for me is pure nostalgia—the century-and-a-half-old Royal Coachman enchanted me as a boy, and the Royal Wulff is just a variation that’s tougher, hairier, and more buoyant than the original. The Royal Wulff is in my view a true “attractor fly,” an odd-to-outright-bizarre pattern (dry, nymph, whatever) that imitates nothing living, nothing a fish will ever eat. Ever seen a hatch of Royal Wulffs? Didn’t think so. But I learned a long time ago that although plausible imitative flies usually win, especially with trout, attractors sometimes out-fish imitations by a big margin. Why? Well, there are theories, but in the end, no one really knows why. Doesn’t matter though—what’s important is that when attractors are best, we should all fish attractors. The Royal Wulff has proven itself to probably well over a million fly fishers—I’m serious—during the 80-plus years since its birth. There, the effectiveness issue: settled. I fish a Royal Wulff when the trout lose interest in my imitative dry flies or when I feel I’m in the right place at the right time for an attractor (innocent cutthroat trout in a river running a smidge low, for example) or just because I’m in a mood to watch something pleasing to my eye drift on water. There, when and where to fish the Royal Wulff: covered. Of course the Royal Wulff is tied commercially—it would be a rare fly shop that didn’t carry it in a range of sizes. It’s safe to assume you’ll also find it for sale in all the on-line fly shops. So, how and where to purchase it: done. When it comes to attractor dries in the small-to-medium size range, there are other fine choices: the Humpy (yellow, Royal, or really any of them), H and L Variant, Purple Haze, even the Renegade with its hackle collar at each end. Try them all if you like; they’re all intriguing, fun flies. But if you rely mainly on the Royal Wulff to cover the category of middling-size attractor dries, you’ll probably get along just fine. There you go, Jack, the five dries and floating emergers I fish most. Dressings follow. HOOK: Light wire, humped shank (pupa/emerger hook), sizes 20 to 16. TAIL: Brown mottled hen-back (or brown partridge or pheasant tail). THORAX: Olive buoyant synthetic dubbing (Superfine Dry Fly, poly…). WING and BURST SHUCK: Natural-dark coastal deer hair. Make a fan of the tips, angling forward slightly, and trim the butts straight across over the rear of the thorax (and trim the sides of the butts if they flare out too far). You’ll have to leave room for a large thread head—only a large one pushing back against the hair will keep it upright. NOTES: I chose this version because it includes the standard, dubbed abdomen you can use for effectively imitating any mayfly and because the BWO (Baetis) is common to trout streams across North America (many mayflies aren’t). HOOK: Light to standard wire, 2X long, slow-curve shank, size 14 to 6. THREAD: Yellow 6/0 to 3/0. (You need a strong thread since it’s exposed over the turns of hackle). HACKLE: One, ginger saddle, three sizes (at least two) small for the hook size. Bind the hackle on slightly back from the front of the body. BODY: Buoyant yellow synthetic or natural dubbing. With the thread hanging at the hook’s bend, spiral the hackle down the body, bind its end, and spiral the thread forward over the body and through the hackle. DUBBED HEAD: Same dubbing as for the body. LEGS: Yellow rubber-strand with black or brown or tan barring, thickness to suit fly size. WING and HEAD: Natural-pale or bleached elk hair. NOTES: If you bind one leg-strand on the near side of the hook and then the second one on the far side using one and the same thread-turn (after that you can add a bunch more turns), you’ll get matching angles on the legs on both sides of the body (as opposed to different angles if you bind on one strand, wind on another thread-turn or two, and add the other). Bind on the rubber-strand legs before you bind on the wing—otherwise the legs won’t angle out well. Note: Only one of many variations, the yellow seems a good choice here because it’s easy to see, makes a fine searching fly when no big insects are showing on the water, and makes a good match for golden stoneflies and grasshoppers. Besides, I fish this yellow version a lot. I just…like it. HOOK: Fine wire, standard length to 1X long, sizes 26 to 18. THREAD: Olive, gray, or black 8/0 or finer. HACKLE: One, grizzly, spiraled up the body. HOOK: Light wire, standard length to 1X long, sizes 20 to 10. ABDOMEN: Buoyant synthetic dubbing (Fly Rite, Superfine Dry Fly…). WING: Yellow poly yarn over brown poly yarn, extending from the rear of the thorax. HACKLE: One, brown, spiraled over the thorax, trimmed to a “V” underneath. THORAX: Same dubbing as in the abdomen. HOOK: Light wire, standard length to 1X long, sizes 18 to 10. THREAD: Black 8/0 or 6/0. WINGS: White calf body or calf tail. BODY: Peacock herl bands at both ends of a red-floss waist. HACKLE: Brown, heavy. It’s heresy, but if you trim a “V’ out of the fibers underneath the fly may not float quite so stubbornly as usual, but you might hook more trout.